My husband teases me because whenever we go to a restaurant, I always order the same things. But hey, I like what I like. One of my standbys is Broccoli Cheddar Cheese Soup. I love it. 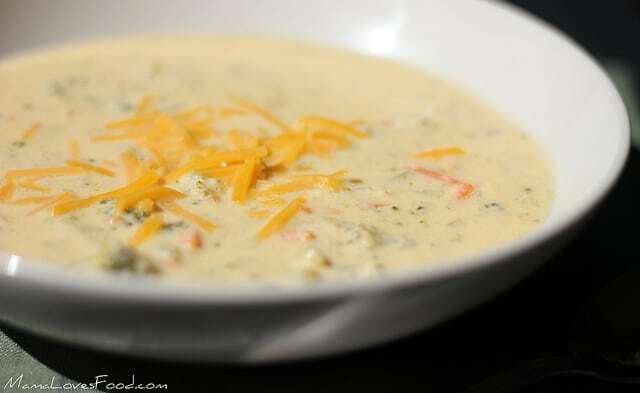 So, in anticipation needing comfort foods in the very near future – you know, what with the new baby coming and maybe possibly a little bit of cool weather, I made a big tasty batch of Broccoli Cheddar Cheese Soup. Saute onion and garlic in butter until onion is translucent. Add chicken stock and nutmeg and bring to a low boil. Add broccoli and carrots and cook until tender. Add cheese and stir until fully melted. Pour in half & half and continue to stir on medium/low heat until all ingredients are incorporated and soup is heated through, being careful not to boil. This looks SOGOOD! I will have to try!!!! I didn't use the whole amount of cheese and I didn't even need the milk. The soup was so creamy and rich all on it's own! I did add a little Frank's hot sauce. Cheese didn't melt, thin, bummer. Can't figure out what I did wrong. oh, no 🙁 i'm sorry it didn't work for you! hi erin – it makes about 18+ cups (depending on how much cooks off), so depends on how big your servings are. as a 1 cup snack, then about 18, as a 4 cup bowl of soup, 5ish. When do we put in the seasoned salt?